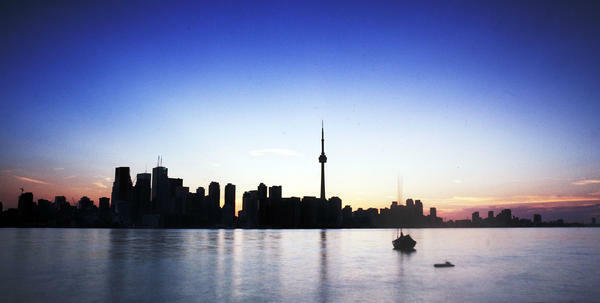 From the Toronto Islands, one of many real-life Toronto locales in Robert Rotenberg's legal thrillers, visitors have a clear view of the city's skyline. 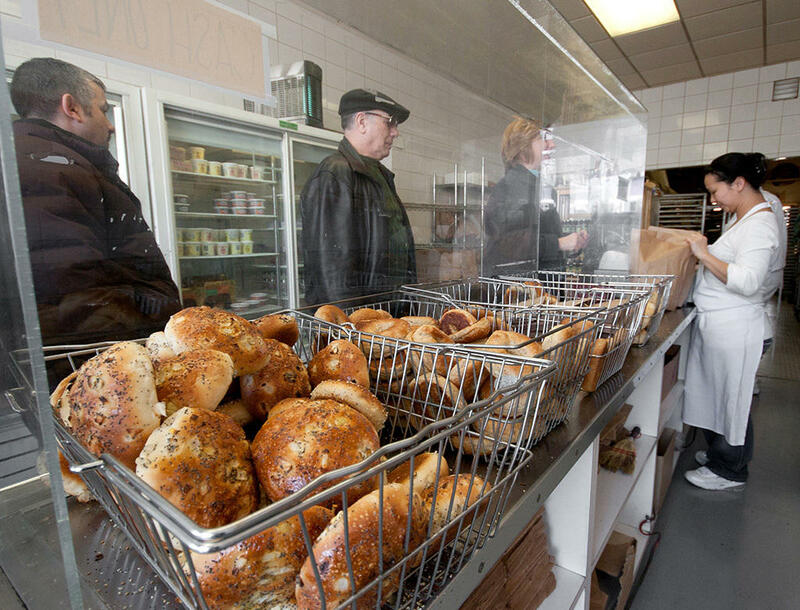 Gryfe's Bagel Bakery is legendary in Toronto, and lines stretch out the door in the morning. The bakery also has a literary claim to fame. Robert Rotenberg has written four legal thrillers set in Toronto, that old industrial city on the shores of Lake Ontario. He's a criminal lawyer — all his books are centered on trials — and he loves his city so much that he makes multicultural Toronto a character in his books. His first release, Old City Hall, is even named after a Toronto landmark: a beautiful stone building that is now used as a courthouse. In that first novel, a trial takes place in Old City Hall's ornate Courtroom 121. "It's a bit of an intimidating room when you're first here as a lawyer, especially as a young lawyer, because it's so big and the judge seems to be so high up," Rotenberg says. "In fact, what I often do is I bring my clients in here on another day to have them look at the space, because sometimes they'll just get overwhelmed by it." Inside Old City Hall, court clerk Kevin Barnes unlocks the courtroom for Rotenberg. Barnes is a well-known court character, partly because he wears white running sneakers and also because he must memorize everything he says in court. He's severely dyslexic and can barely read — but he did read Rotenberg's first Toronto novel. "I kept on giving Mr. Rotenberg updates when I read the Old City Hall," Barnes says. "From the time that I picked up the book to the time that I finished it, it took me roughly eight and a half months." Rotenberg has appeared in Toronto's courts many times, and he takes great pains in his books to portray the relatively calm atmosphere of Canadian courts, where high court lawyers wear robes and tabbed collars and always refer to their opponents as "my friend" or "my learned friend." "There are no gavels in Canadian courts," Rotenberg explains. "There's a certain decorum that's expected. Lawyers call each other friends — even if they're horribly combative, they still say, 'Well, my friend says, my friend says this.' We bow before we come into court, and we bow when we leave. And I think it's a really good thing, because you're dealing with these horrible things; you're dealing with murders and rapes and real huge human tragedies." Rotenberg keeps a tiny office at a downtown law firm. He still practices a bit, and the office represents his transition from lawyer to author. "This is kind of my life," he says. "This drawer, these are all my client files, there are all the cases I do — and in this drawer, this is all my writing stuff." Some of Rotenberg's writing ideas are mined from his own life. One of his main characters, homicide detective Ari Greene, has an elderly father who is a Holocaust survivor — like the grandparents of some of Rotenberg's childhood playmates. Rotenberg also sends the detective to Gryfe's Bagel Bakery in the old Jewish neighborhood where the author grew up. It's a real bakery, now run by Moise Gryfe, a son of the family that started the business. Inside the bakery, Gryfe realizes Rotenberg is the author of Old City Hall. "It talks about my mother in there," he says. Rotenberg tries to launch into a memory, but Gryfe interrupts him: "She used to give half the store away." Over the years, this neighborhood has changed; it's not what it was when Rotenberg was growing up. "It used to be Jewish and Italian, and now it's Filipino and Orthodox Jews," Gryfe says. "Gryfe's was a simple storefront, and the lineup of men stretched back on to the corner. Most of them were bent over, tapping at their BlackBerrys, talking to their wives on their cell phones, or reading portions of the sports pages, which blared headlines about the Leafs' victory." That passage references one bit of ersatz Toronto lore in Old City Hall. The Maple Leafs did not win the Stanley Cup that year — they last won it in 1967. "I can actually remember the moment I thought of the idea, and I burst out laughing — I was all by myself," Rotenberg says. "And I just thought, you know what, it's my book. You know, they're never gonna win the Stanley Cup in my lifetime, so I at least might as well let them win in my book." Rotenberg suggests a trip to Ward's Island, where one of his characters lives. It's a beautiful wooded part of the Toronto Islands, about a 20-minute ferry ride into Toronto's Inner Harbour. "When I think of a character, almost the very first thing I think of, [is] where do they live?" Rotenberg says. "Knowing where they live really tells me a great deal about who they are, and if I don't know where they live I can't write about them." In the first book, policeman Daniel Kennicott visits prosecutor Jo Summers at her home in the Toronto Islands. To research that scene, Rotenberg walked around the summer cottages on Ward's Island until he found one that fit his plot. Standing in front of that stranger's cottage — he has no idea who actually lives there — he says, "This is the house that I chose for Jo. I wanted her to live near enough to the ferry so in the climactic scene when Daniel has to run he can hear the horn of the ferry boat and rush out there." Rotenberg's attention to accuracy is impressive, especially for a book that is, after all, fictional. "Maybe it's the criminal lawyer in me, but it's all details," Rotenberg says. "I actually ran from here to the ferry boat to make sure that the number of minutes I said it took him was the exact same number." Rotenberg has assembled an unusually large and almost Dickensian band of lawyers, police and journalists who circulate around the courts. "I don't think it was a conscious decision to have all these characters," he explains. "It's just how it felt to me — that just to tell the story, I just needed all these different points of view." "People always say, 'Who's the main character?' And although Detective Ari Greene is kind of the central character, he's not really the main character," Rotenberg says. "He's kind of like the moral center and everyone kind of circles around him." In his fourth book, Rotenberg may be thinning the herd: Without spoiling the story, let's just say that some of those characters are edited out ... permanently. "Well, they are murder mysteries," he says, laughing. And there are more on the way. Rotenberg has written four novels so far; he says he plans to write 20 legal thrillers set in Toronto, one each year. It is Canada Day. Our neighbor to the north is celebrating 146 years of nationhood. They'll celebrate with fireworks. We are marking the occasion with this morning's installment of our summer crime fiction series, Crime in the City. Let's go to Canada's financial capital, Toronto. NPR's Linda Wertheimer traveled there to meet up with Canadian author meet Robert Rotenberg. He's written four legal thrillers set in that vibrant, diverse city on the north shore of Lake Ontario. Robert Rotenberg loves his city, maybe even more than most crime writers. He makes multicultural Toronto a character in his books. All the books are centered on trials. Rotenberg is a criminal lawyer. His first book is called "Old City Hall," after a beautiful stone building that's now used as a courthouse. And in the first book, a trial takes place there, in ornate Courtroom 121. ROBERT ROTENBERG: It's a bit of an intimidating room when you're first here as a lawyer, especially as a young lawyer because it's so big and the judge seems to be so high up. And, in fact what I often do is I bring my clients in here on another day, to have them look at the space because sometimes they'll just get overwhelmed by it. WERTHEIMER: The court clerk Kevin Barnes unlocks the courtroom for us. He appears in the novel as himself. He's a well-known court character, in part because he wears white running shoes. And also, because he must memorize everything he says in court. He's severely dyslexic and can barely read but he did read "Old City Hall." KEVIN BARNES: Now, I kept on giving Mr. Rotenberg updates when I read the "Old City Hall." From the time that I picked up the book to the time that I finished it, it took me rough eight and a half months. WERTHEIMER: Rotenberg has appeared in Toronto courts many times, and takes great pains in his books to portray the relatively calm atmosphere of Canadian courts, where High Court lawyers wear robes and tabbed collars, and always refer to their opponents as My Friend or My Learned Friend. ROTENBERG: There are no gavels in Canadian courts. ROTENBERG: There's a certain decorum that's expected. Lawyers call each other friends. Even if they're horribly combative, they still say, well, my friend says this. And we bow before we come into court and we bow when we leave. And I think it's a really good thing because you're dealing with these horrible things. You're dealing with murders and rapes and real huge human tragedies. WERTHEIMER: That's Robert Rotenberg speaking in the Law Library of a downtown firm where he keeps a tiny office. He still practices a bit. The office represents a transitional space, from lawyer to author. ROTENBERG: This is kind of my life. This drawer, these are all my client files. ROTENBERG: There are all the cases I do. And in this drawer, this is all my writing stuff. ROTENBERG: So these are all my contracts, writing ideas, et cetera. WERTHEIMER: Rotenberg mines his own life for ideas. Raised in a Jewish section of the city, he remembers playmates whose grandparents were Holocaust survivors. He gave one of his main characters, Homicide Detective Ari Green, an elderly father who is a survivor. And Rotenberg also sends the detective to Gryfe's Bagel Bakery in the old neighborhood. It's a real bakery, now run by Moise Gryfe, a son of the family that started the business. MOISE GRYFE: Oh, you wrote the "Old City Hall" book. GRYFE: It talks about my mother in there. GRYFE: She give half the store away. WERTHEIMER: So the neighborhood has gotten more and more Orthodox over the years, I guess. GRYFE: This neighborhood has changed. It used to be Jewish and Italian. Now it's Filipino and Orthodox Jews. Still have to eat bagels. WERTHEIMER: Rotenberg fished a copy of the book out of his backpack to show Moise Gryfe, and asked him to read the description of the bakery. GRYFE: (Reading) Gryfe's was a simple storefront and the lineup of men stretched back on to the corner. Most of them were bent over, tapping at their Blackberries, talking to their wives on their cell phones, and reading portions of the sports pages which blared headlines about the Leafs' victory. WERTHEIMER: Rotenberg sets great store by accuracy. But, as you just heard, there is one bit of ersatz Toronto lore in the first book. The Maple Leafs did not win the Stanley Cup that year. They last won it in 1967. ROTENBERG: I can actually remember the moment I thought of the idea and I burst out laughing. I was all by myself. And I just thought you know what? My book, you know, they're never going to win the Stanley Cup in my lifetime. So I at least might as well let them win in my book. WERTHEIMER: Continuing with our tour of Toronto, taken straight out of his books, Rotenberg suggested a trip to Toronto Island, where one of his characters lives. It's a beautiful wooded island, perhaps a 20-minute ferry ride into the harbor. I asked Rotenberg if he knows where all his characters live. ROTENBERG: Yes. When I think of a character, almost the very first thing I think of is where do they live? Knowing where they live really tells me a great deal about who they are. And if I don't know where they live, I can't write about them. WERTHEIMER: Rotenberg's characters might live in ethnic neighborhoods, their house might be large or small - all identifying markers for Rotenberg. In the first book, policeman Daniel Kennicott visits prosecutor Jo Summers at her home on Toronto Island. Rotenberg walked around the summer cottages on the island to find one that fit his plot. ROTENBERG: This is the house that I chose for Jo. I wanted her to live near enough to the ferry, so in the climactic scene - when Daniel has to run - he can hear the horn of the ferryboat and rush out there. WERTHEIMER: This is mighty fine attention to detail, it seems to me. ROTENBERG: Maybe it's the criminal lawyer in me, but its all details. I actually ran from here to the ferryboat to make sure that the number of minutes I said it took him, was the exact same number. WERTHEIMER: So do you know who lives here? WERTHEIMER: Rotenberg has assembled an unusually large and almost Dickensian band of lawyers, police and journalists who circulate around the courts. In the fourth book, he may be thinning the herd: He murders one of his important characters. But Rotenberg told us he wanted lots of people in his sandbox. ROTENBERG: I don't think it was a conscious decision to have all these characters. It's just how it felt to me. That just to tell the story, I just needed all these different points of view. People always say who's the main character and, although Detective Ari Greene is kind of the central character, he's not really the main character. He's kind of like the moral center and everyone kind of circles around him. WERTHEIMER: I've noticed that you are editing characters out of this ensemble. I don't want to do any spoiling here, but some of them have been edited out permanently. ROTENBERG: Well, they are murder mysteries. WERTHEIMER: Robert Rotenberg has written four books so far. He says he plans to write 20 legal thrillers set in Toronto, one a year. Reporting on Crime in the City, I'm Linda Wertheimer. GREENE: And you can visit all the cities from our crime fiction series. We even have a map to help you find your. It's all at NPR.org/crimeinthecity.